He wiped up the Presidential election and now you can use him to wipe up your historical messes! Love him? Hate him? 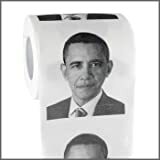 Either way... you"ll love this Barack Obama Funny Toilet Paper. Printed throughout the whole roll! Want to have Obama in your bathroom... YES YOU CAN have him in THE CAN! Stop leaving those coins on the dresser, in some old water jug tucked away in a closet, or in your car"s ashtray. With our hilarious Fanny Bank, saving your pennies will be a real gas! Drop in a coin and hear this bank fart in digital audio. It"s so loud and so disgusting, you won"t want to stop dropping coins in the crack! This bank is fun, practical and entertaining! And don"t worry, you don"t have to smash this piggy bank, the coins can be easily removed by sliding off the top of the bank.